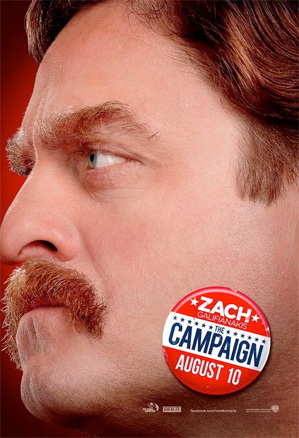 Just yesterday Cam Brady (Will Ferrell) and Marty Huggins (Zack Galifianakis) won over animal lovers with their patriotic posters for The Campaign, the political comedy from Jay Roach (Meet the Parents, Recount). 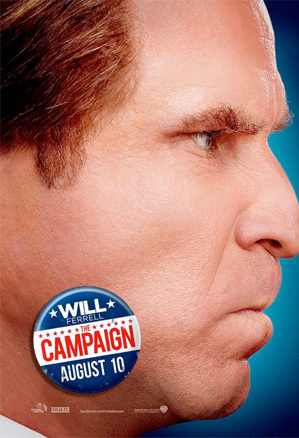 Now the two Congressional candidates are back to facing off, quite literally, as two new character posters have emerged that look phenomenal side-by-side. With their noses pressed firmly against one another, Brady and Huggins mean business. If the first trailer was any indicator of the laughs in store for this comedy, then August can't get here soon enough. Hopefully we'll see another trailer very soon. Look! One unfunny, the other even moreso. You guys are just a bunch of cunts aren't you. Wait, Zach Galifianakis is the republican? lol I caught that too. This movie is going straight to dvd ....but let keep putting up posts about it. Sadly this fails because they didn't actually put them nose to nose. I'm sure they're both more than willing to do so, but it's probably a scheduling problem than artistic. Still, this is middle-school level digital art, and a C- at that. I'd never put this out for print.